Some people remove the skins from the tomatoes once they cool — I happen to like them and think it gives the dish a rustic quality. Once you eat every last one of the tomatoes, you’ll have pan of herbed, tomatoey olive oil left: don’t toss it! We’ve been using it in salad dressings, as a bread dip, or to drizzle over morning eggs. Prepare the tomatoes: Preheat the oven to 300 F. Lay tomatoes, garlic, rosemary and salt in a heavy-bottomed baking dish. Pour olive over the tomatoes evenly and bake for 35-45 minutes, or until tomatoes are soft and skin is beginning to shrivel. Discard herbs and allow to cool slightly. Make the polenta: In a saucepan, simmer the corn and juices with the milk over medium heat, stirring until thick, about 6-8 minutes. Add the salt and pepper; fold in chives, butter (if using) and Parmesan cheese. 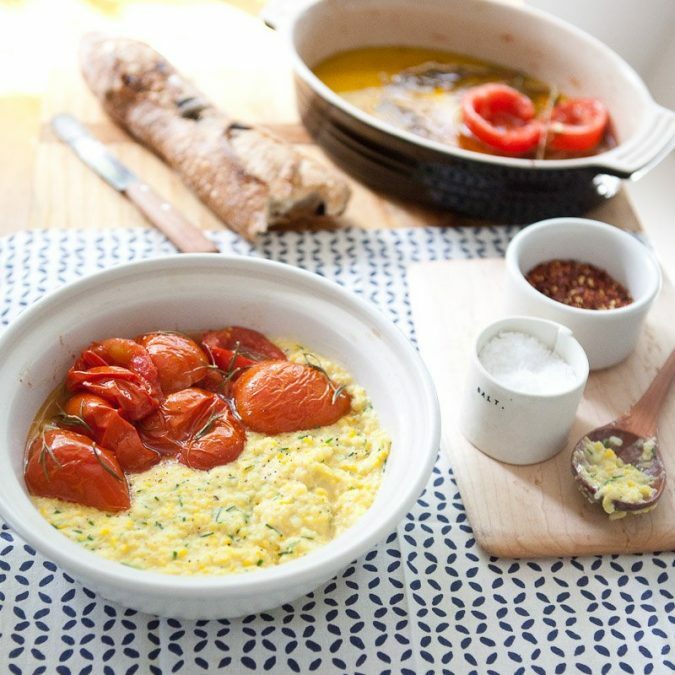 To serve: Scoop the warm polenta into a small serving dish and spoon the soft, warm tomatoes on top. Sprinkle with a little flaky salt, if desired. Serve immediately. Save the herbed olive-oil to use in other recipes (salad dressings, drizzle over eggs or dip for crusty bread).